Jeddah : Saudi Arabian forces have successfully thwarted yet another attempt by the Houthi militias to attack civilian and populated areas by breaching the kingdom’s ballistic defence system. According to the Saudi-led coalition, Yemeni rebels fired a “ballistic missile” at densely populated civilian areas in Jizan, which also houses a 400,000-barrel-per-day refinery of Aramco and other key facilities. “The missile was intercepted and destroyed by Royal Saudi Air defence,” the coalition statement said. No casualties were recorded. It was the latest in a series of such attacks. “Saudi air defences intercepted a ballistic missile launched by the Huthi militias targeting Jizan,” the coalition said in a statement. A statement published on Huthi controlled Al-Masirah news outlet claims that they fired a “Badr 1” ballistic missile and said it struck Jizan Regional Airport. However, international media outlets, citing open-source flight information, confirmed that the airport’s normal activity was not disrupted with flights arriving and departing on time. Official Spokesman of the Saudi-led Arab coalition to restore legitimacy in Yemen Col. Turki Al-Malki said that the Saudi Royal Saudi Air Defence detected a ballistic missile launch from Sa’dah, Yemen at 10:02 am. The missile was intercepted before it could hit its target, Al-Maliki said adding that the interception resulted in missile fragments falling in some residential areas. The ballistic missile, Al Maliki said, was launched deliberately by the Iran-backed Houthi militia to target densely populated civilian areas in Jizan. “This hostile act carried out by the Iranian Houthi militia proves that the Iranian regime is still providing the terrorist Houthi armed militia with qualitative capabilities, in flagrant defiance of UNSCRs 2216 and 2231, with the main objective of threatening the Saudi Arabian, regional and international security,” Col. Al-Malki also said. “Launching ballistic missiles at densely populated civilian areas is a direct breach of the principles of the international humanitarian law,” he stressed. Saudi Arabia has since March 2015 led a coalition of Arab states fighting to roll back the Huthi rebels in Yemen and restore its government to power. Earlier this week, Saudi air defences shot down a ballistic missile attack by the Houthis. The incident happened hours after the coalition warned of a “painful” response if the Houthis mounted new attacks on Saudi Arabia using what it said were Iran-supplied drones. So far, the Houthis have launched over 100 missiles at Saudi cities and installations. Earlier this month, Saudi Arabia’s air defence forces intercepted three ballistic missiles fired at Riyadh and other cities. 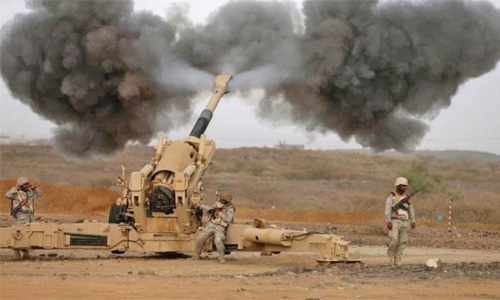 Three rockets were shot down above the capital and the southern cities of Jizan and Najran, according to state media and the Saudi-led coalition fighting the Iran-aligned Houthis in Yemen. Yesterday’s attack also follows the report of the death of a senior Houthi military commander, Major-General Nasser Hussein al-Qubari, who was fighting Saudi troops in Yemen’s northern Saada province. Houthi-run SABA news agency confirmed the incident without giving additional details regarding the circumstances of his death. According to a Yemeni military source, the slain commander had been responsible for Houthi forces deployed near the border with Saudi Arabia. “Al-Qubari had been working with Yemeni Republican Guard forces loyal to the late President Ali Abdullah Saleh,” the military source, preferring anonymity for security reasons, told Anadolu Agency. Arms monitor Conflict Armament Research says it has evidence that the drones used and other Houthi kit were made in Iran and was not of indigenous design and construction “in contrast to Houthi statements”. Nearly 10,000 people have since been killed in the conflict, in what the UN has called the world’s worst crisis.